Karkarooc’s southern boundary was about 7 km south of Beulah. In 1896 one railway line reached the shire, ending at its administrative centre, Hopetoun, near the shire’s geographic centre. It took until 1925 for all the shire’s railway access routes to be completed, serving its vast wheatlands: in the west, the line ending at Yaapeet (1914), in the middle from Hopetoun to Patchewollock (1925) and in the east, the line through Woomelang, Lascelles and Speed (1903). The last two railways paralleled the Henty and Sunraysia Highways respectively. The Henty Highway also runs approximately parallel to the Yarriambiack Creek, a tributary of the Wimmera River, which rises in the Grampians and empties into Lake Coorong near Hopetoun. The creek was followed by pastoralists who settled around the lake in 1846. The Lake Coorong pastoral run was taken over in 1876 by Edward Lascelles, who pioneered more intense pastoral settlement in the Mallee region in the face of vermin and rabbit infestation. 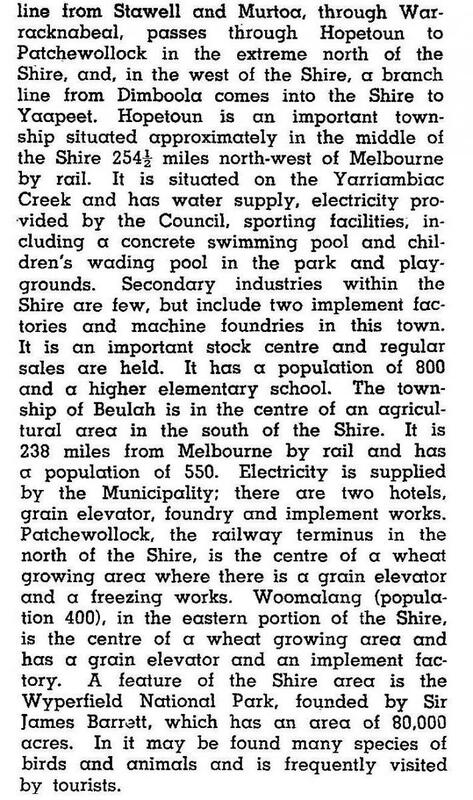 Within five years Lascelles subdivided land for wheat growing, introduced irrigation, had the Hopetoun town surveyed and started the railway line extension from Beulah. The town of Lascelles was named after him and he was Karkarooc’s first shire president. The main products of the shire continued. In 1994 there were 187,000 sheep and lambs and harvests of 141,000 tonnes of barley and 134,000 tonnes of wheat. Farming occupied 82% of the shire’s 3719 sq km. 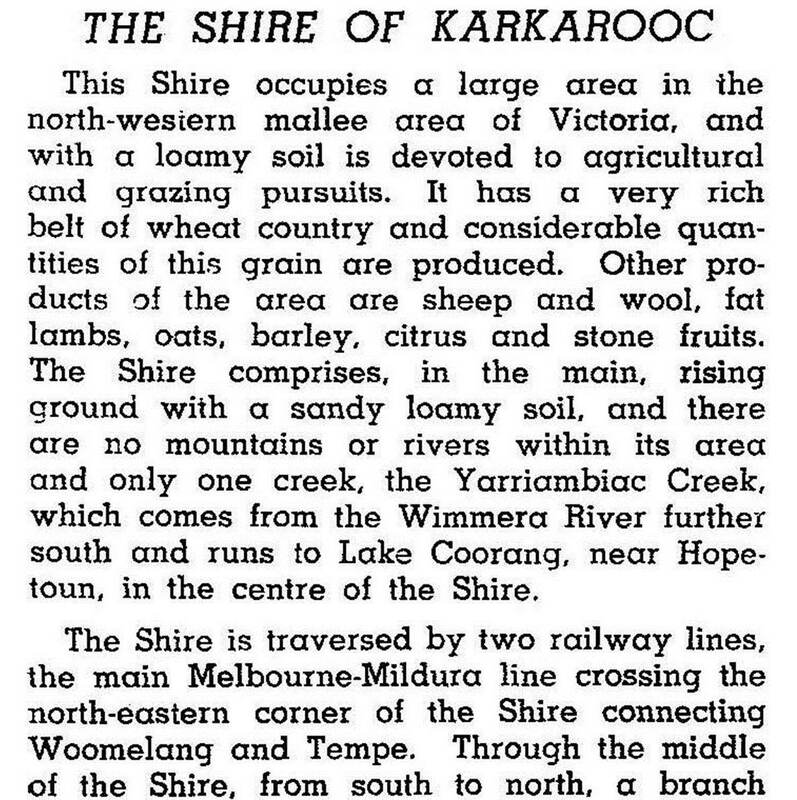 On 20 January 1995, Karkarooc shire was united with Warracknabeal shire, most of Dunmunkle shire and part of Wimmera shire to form Yarriambiack shire.